Psst, Spy Kids: Are you curious and interested in real spy secrets? I have some secrets for you! I wanted to be a secret agent for as long as I can remember. When I was a boy, I was making my own gadgets. And since then, I've been collecting everything I could find about the art of spying. Whether you want to know about the intelligence community, learn about the ◙◙◙, ◙◙◙, and ◙◙◙, or you want to check what your siblings are doing, you've come to the right place! I hope you like the adventures here at TSS HQ, please spread the word to other trustworthy agents! That's it for now. Be safe! P.S. Stay in touch with new and interesting spy techniques and gadgets. Leave your e-mail address and code name, and you'll receive messages from Uncle (TSS Headquarters) in your dead letter box (a.k.a. mailbox) at irregular intervals. And, from one spy to another, your information is completely secure! 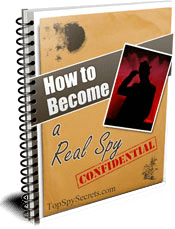 As a subscriber to our espionage newsletter, you will get immediate access to our FREE 18-page TOP SECRET report, providing you with insider information on becoming a real spy. Subscribe below, and you'll be able to download it right away!